Kitchens sell houses right?! Well not that we are selling this house any time soon, but I wanted it to be a kitchen that would sell the whole house! Stage one, was convincing a kitchen joiner/designer to build or design a kitchen around a butlers sink! Growing up with one of these in England, they are a feature. 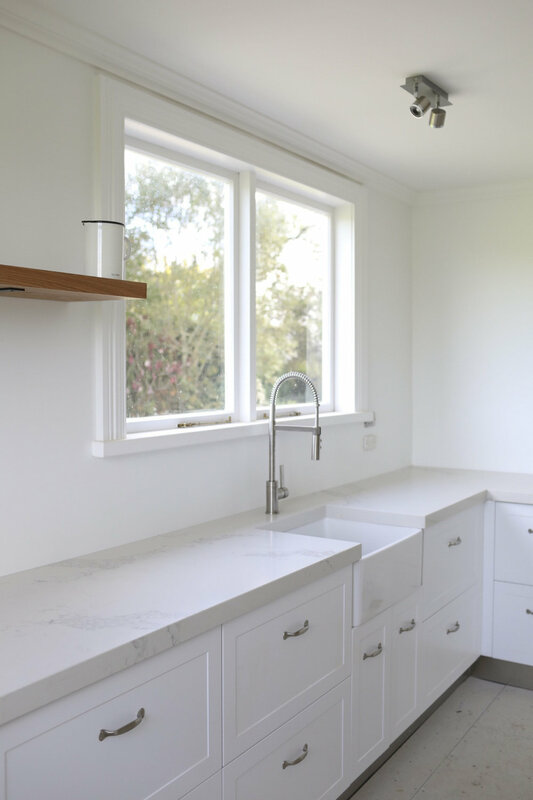 I couldn’t forfeit a farmhouse sink in a farmhouse…One well known kitchen brand here in NZ made things slightly tricky…they refused to use a Caesarstone bench top if there was a butler sink. They said it wasn’t possible….HA! We sure enough showed them as Brett from Coastwide Joinery (who we worked with) popped the butlers sink in amongst the Caesarstone and was no issue! I cannot recommend Brett highly enough as anything was possible. Nothing was a drama with him even when we kept adding more and more ideas on to his plate. I was fairly frightened about where to start with designing this kitchen. The space was small and the original kitchen made it feel even smaller and very dark. There was huge windows in here, yet it seemed that no light was making its way in. After brainstorming and sharing my thoughts to get rid of the island so that the kitchen was open to the living and dining room spaces, we came up with the perfect layout. The next step was all the finer details…budget, colours of cabinets, handles, stove, shelving and storage solutions, bench top and flooring. We made a trip to Christchurch at the end of January and just in time to source everything we needed at the final day of the end of year sales. This was magical! I don’t think we paid full price on any item in the kitchen. The sale Gods were with us. Especially the Smeg Gods. Here are the images from when the old kitchen was taken out, painting took place and the new kitchen was installed through to the tiles on the floor! After the kitchen was installed, it was time to get my creative cap and styling shoes on and get the kitchen filled with the items that make it home. The vibe of the entire house was to feel cosy and homely from the moment you walk through the front door. We wanted the kitchen/dining to be a practical entertaining space which would end up being the hub of the house. The final kitchen is just about done and we are a month from opening. It has taken me time to get all the small things finished and art on the walls etc…But we are proud of it and what it turned out like. Turns out designing a kitchen is the least scary part; the budget is the most terrifying! What the kitchen looks like today.